You can never be totally certain that you don’t need money on short notice. An illiquid stock also makes it hard to profit from superior insight. For example: you can’t turn on a dime and exit when you change your mind. The question of course if how much you want to be paid for illiquidity risk, and how much the market is willing to pay you for that risk. In my opinion you shouldn’t be paid a whole lot to take on illiquidity risk. The main reason is that stocks are only a suitable investment if you have a long-term horizon. But why would you need intraday liquidity if you are holding an asset for a multi-year period? The answer is simple: you don’t! The value of being able to trade out of your position in a few microseconds is negligible when your intention is to hold it for years or even decades. As is visible the difference in performance is huge. Especially when we look at the microcap segment where it is a whopping 14% per annum while taking less risk at the same time (if we accept the standard deviation as a risk measure). I don’t know if I’m able to add alpha to my portfolio. I of course think that I do, but by structuring my portfolio in a such a way that I have exposure to factors that have outperformed in the past I’m hedging my bets. Besides a bet on illiquidity my portfolio is of course also a bet on small-sized firms and value stocks. And the big question is of course: can we expect that the illiquidity premium persists in the future? I think that it will because of how the financial services industry is structured. Most individual investors don’t really need very liquid assets because they do have a long-term horizon. But they do park their money in ETF’s, mutual funds and hedge funds, and the managers of those funds can’t afford to buy illiquid assets. They never know when their investors want to withdraw, so they always have to plan for the worst. As an individual investor you don’t face this risk, and because of that illiquid assets are a great match if you want to generate high returns over a long-term horizon. I think that is (or should be) the goal of most investors, but as long as they don’t realize what they are implicitly paying for the liquidity they don’t use they will be at a disadvantage. This entry was posted in General on May 1, 2014 by Alpha Vulture. Very enjoyable post. I agree with a lot of what you said. I saw an interview with Stephen Schwarzman (head of Blackstone) recently, where he said “liquidity is overrated”. And I think it is. Of course you want to be able to access some portion of your portfolio quickly, but if you need to access all of it, you’re not a long term investor. I also think that if you invest in illiquid assets, it’s good for discipline. If the bid offer is so large that you know that you really have to hold the position for a long time you really have to make sure it’s a great idea. Must admit I’m a bit sceptical of the research in the “large cap” space. 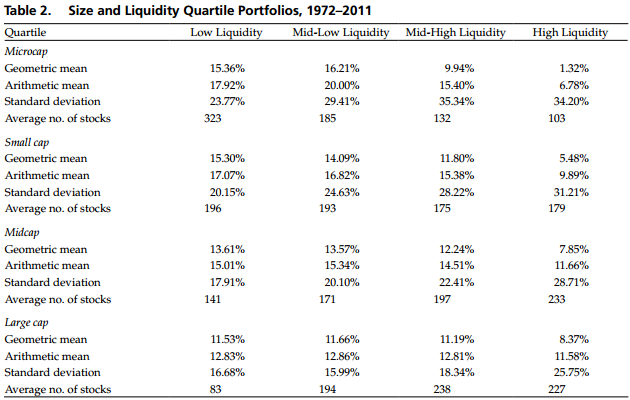 Even the most “illiquid” quartile should offer ample liquidity to the vast majority of investors. I’m very surprised that there seems to be such a “premium” available. About the premium in the large cap space: I agree that it is surprising, but I do have a hypothesis on why it is there. Liquidity is defined in this paper as number of shares traded compared to number of shares outstanding. The stocks with a lot of activity could easily be speculative stocks that attract day traders, but offer low long-term returns. Yeah exactly, the article has a bit of a strange definition of liquidity. Basically what it tells you is that you should avoid ‘hot stocks’. In microcap space these are probably pump-and-dump schemes and in large cap space stocks like SalesForce and Tesla. But really, is any large cap really ‘illiquid’? I don’t think so. Some of the stuff that you suggest on your blog is reasonably liquid (Solitron, Awilco, Asta funding) and other stuff is illiquid even for personal accounts (Schuff, Conduril, PD-RX). I don’t think the liquidity difference will be a factor for expected future returns here. Nevertheless I more or less agree that (a lack of) liquidity is overrated, especially for personal accounts. I think turnover is a pretty sensible definition of liquidity? Do you think there is a better alternative? I don’t know if the liquidity difference between the more liquid stocks in my portfolio won’t be a factor for expected future returns. Is it a coincidence that the three very illiquid stocks that you listed have also outperformed the stuff you describe as reasonable liquid? PS. Not sure if Solitron belongs in the reasonable liquid category. I don’t think it is a very good definition. The crucial thing is imho that liquidity is the market’s _ability_ to buy / sell assets quickly without a huge price impact (roughly copied from Wikipedia). In some cases the ability is there even without turnover (example: a market maker is sponsoring a stock). And in other cases the turnover is there without liquidity (i.e. in a pump & dump scheme there’s a lot of trading but the price also changes quickly). I guess it’s a bit of definition nitpicking but if the research points out that AIG will outperform TSLA I think that has nothing to do with liquidity – enough liquidity in AIG to buy and sell huge amounts of stock. In fact, it wouldn’t surprise me that if you sell a similar position in TSLA (same % of free float) and in AIG the price of TSLA would move more due to momentum traders, short interest etc. The stock has a much higher volatility. At some point, turnover != liquidity. It is very hard to come up with a better definition that is also easily measurable and that is probably why they use this. But if research points out that illiquid smallcaps outperform liquid ones by 10-15% per annum you should take the research with a grain of salt .. You probably agree with that. As for the coincidence you mentioned: probably the illiquidity in a name increases the chance that it is mispriced. For example: Conduril is extremely illiquid with a forced seller. But the future outperformance (if any) comes from a potential mispricing, not from the lack of liquidity, I would say. Another problem is the fact that, for example in Schuff, the outperformance is there but the stock is so illiquid that you cannot even buy a full position. Basically, what the research points out is that you should avoid popular stocks. And that makes sense. I more or less agree with you, but one question that remains (and probably a though one to answer/research): are popular stocks liquid because they are popular, or are liquid stocks popular because they are liquid? My guess: it’s a bit of both so it’s not only popularity that you want to avoid.